Oscar Robertson - nicknamed ‘The Big O’, is the all-time leader in triple doubles in the National Basketball Assocation. He compiled 181 triple doubles during his playing career with the Cincinnati Royals and the Milwaukee Bucks (1960 to 1974). 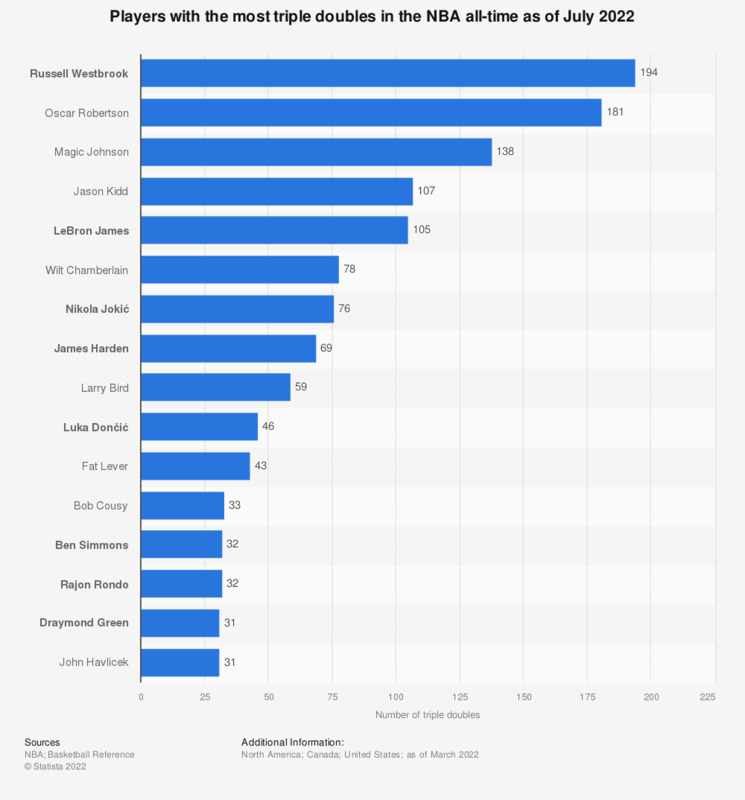 The highest ranked active player is Russell Westbrook of the Oklahoma City Thunder with 138 triple doubles, tied with Earvin 'Magic’ Johson for second place. In the National Basketball Association statistical categories are kept on a per game basis for each individual player including points, rebounds, assists and steals. When a player reaches a score of ten or more in at least three of these statistical categories in a game, he records a triple double (e.g. 10 points, 10 assists, 10 rebounds). All the players on the list with at least 100 triple doubles in their career are versatile, strong, and athletic guards able to handle the ball on the offensive end. This enables these players to score at a high level and assist on many other baskets. Their size and basketball smarts often also make them good rebounders. Over the course of the past three NBA seasons from 2016 to 2019 Russell Westbrook managed to average a triple double, with an actual triple double in 101 of the 234 games he played in during that time frame. If Westbrook continues to perform at this level, he has a chance to pass Oscar Robertson as the all-time NBA triple double leader either in the 2019/20 or 2020/21 season. * Players shown in bold are active players. Do you think the use of steroids and other performance-enhancing drugs by professional athletes is a major problem or not?